Having grown up in a pretty rural setting Jim is used to seeing cattle stops --- the idea is that cattle just cant stand up on them so they cant get passed them. Jim decides to make a cattle stop for cars --- in the road he places a whole lot of rollers. The speed these rollers turn is controlled by computer taking input from a speed camera, so that no matter how hard the car tries it just cant get past the car stop. Eureka! Jim declares. He figures he can use this bit of kit to slow cars down --- not just stop them. [Kat] - Car.... Cattle..... geddit? Well, [The Kat], I'm glad you asked. A "cartle stop" is a function of cat grammar which I'm sure you are passingly familiar with. "Cartle," you see, isn't a verb or noun, but an adjective -- "of or relating to the Cartl." It is closely related to a human's "Glottal Stop" but it occurs when cats hack up hairballs. Instead of a brief speech hesitation caused by a momentary closure of the glottis, it is the suffocating noise in an alley cat's night song caused by temporary hairball obstruction. I have no idea what this has to do with cows, motor vehicles, or speed control. Thanks for sorting that out [contracts], I had completely misunderstood. Cattle themselves make pretty good cartle stops. [+] for obstructing traffic. Perhaps Jim should start working on a Cartle-bout so that you never have to worry about round-abouts (turing circles for the Brits) again. The camera knows how fast the car is moving, but how does it know how fast the wheels are spinning? How does it act as a speed governor if the driver guns the engine? 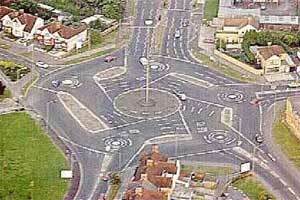 + for traffic calming but - because I'm not sure how it works so neutral. I'm not sure. If it was built the size of a cattle grid (ie not much longer than the car) then the overall effect would be to attempt to stop the car in its own length. If it were possible from 60mph, that would be very dangerous and would likely kill or injure the occupants. In practice, the tyre/road interface is the limiting factor, and the car will simply skid over the rollers and continue. To be effective, the system would have to be made of several dozen metres of rollers-covered road. [david_scothern] I figure it will work much like the travelator on gladiators --- notice how everytime someone jumps on the tend to tip forward. That is the inertia of their upper body continuing forward motion while there feet are left behind (accelerated backwards...). If you have every pushed a toy car onto a tavelator type thingy then you notice that it jumps about abit. That is because the back wheels are pushing and the front wheels are stopping... To avoid this the rollers will have to gently be brought up to speed as the car enters the trap! Indeed, you'd need to bring the rollers up to speed fairly gently. Therefore it would take a little while to reach full effectiveness, and during that time the car that was doing 60mph (88 feet per second) would cover a considerable distance. Decelerating at 1g to a standstill would require 130 feet of rollers. If you were using it to slow a car down from 60mph to 50mph, perhaps only 20 feet of rollers would be needed. Could be useful as a security entrance; if you had the space to construct it then it would make a good barrier against car bombs for example. They wouldn't be able to get past without sabotaging the system and giving their intentions away. I'm not sure how driving onto a unpredictably moving surface can be thought of as providing safety. For security, it might provide an anti-car-bomb defence were a building surrounded by these things. Plain old walls might be cheaper. You could install one of these in the front gate I suppose, though it might make visitors think they were entering an automated car-wash. The rollers would have to have a similar coefficient of friction to the road surface to be safe. Steel rollers would be like ice in the wet. Conventional cattle grids (as they are called in the UK) can be really slippy in the driving rain that usually acconpanies the ones in the Lake District. These would work until cars learnt to cross them in the same way that sheep have [link]. Hold on I can see the onset of the altruistic car with optional emotion chip upgrade... Perhaps the choosen car can fling itself on the rollers while the others drive over the top! Would the squashed car be something flat like a ferrari and would those that go over the top be hunky 4x4s? I can't see a Ferrari thinking that way. Maybe a Prius. In general, I think a Prius is much more apt to think than a Ferrari. I think that a stretch four-wheel-drive would offer some specific advantages in this situation. Make them free spinning. That would be VERY funny watching some hapless person stuck on the road because of the spinning rollers! What exactly would be the point of the cartle stop? I fear the basic principle has been thoroughly baked about 40 years ago. The deer 'safari park' at Queenstown, New Zealand, used to have the exit arranged so that cars leaving had to drive down an decline which included a grid of free running rollers then make another turn to go onto the road. The purpose was to prevent freeloaders coming in via the exit as driving up over the rollers was impossible. Work will need to be performed to decelerate the car. [akubra] If the cartle stop was placed on an incline then the speed required to get over it would be a function of the gradient, gravity and its length. If the cartle stop cannot be made long enough then having free wheeling rollers is only going to encourage more speed not less. We've got a moveable barrier system on the Coronado Bay bridge here in San Diego. Photo in the link is from some place else less wonderful, but it shows how it works. There is one on the Tappen Zee bridge in New York, but there is only one barrier, unlike the two in the link, so you can switch which roadway has 3 lanes and which has 4. If you watch long enough and you may see the truck move the barrier.